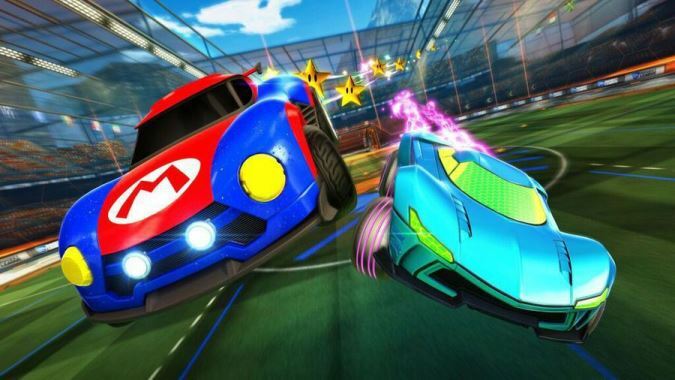 Welcome to the official discussion thread for Rocket League on the Switch! To start, please add this game to your log, add it to your collection (if applicable), and (when you are ready) rate it using the link above! @Zero While this hasn't happened to me, it did happen to my friend during a match. It was funny to watch. I have heard that sometimes, the Switch has a weaker connection if it's been powered on for long periods of time. When was the last time you powered down your Switch? By which I mean, actually turn it off by holding down the power button for over three seconds and selecting the "turn off" option. If you've just been leaving it in sleep mode for a lengthy period, it may be the cause. Worth a try, at any rate. Probably months ago. I'll try that out. Connections seem to be a bit better since switching my wifi to another frequency. And I finally turned pro! I sure don't feel like a pro though. Yes, there's a Stats screen under the Extras menu option. Not only are tournaments now live but we have a quality control option on the Switch. I shall try it out when I get home. edit: You can now listen to in game music while playing a match! Quality improvements don't seem worth losing 60FPS for a game like this. Cool that it's an option though. So does this update add crossplay parties? @Hinph Yeah, this is definitely the sort of game where 60fps plays more smoothly, plus Rocket League has pretty bland graphics that 1080p doesn't really do much. Then again, I'm someone who would rather have 720p/60 than 1080p/30 for pretty much any game. It looked like there were some new stadiums too? At least, they felt new to me. If not I'm just going wacko. The space and underwater stadiums at least, right? I was really amused by the whale noises. Yeah, I bought an Xbox One X so I could fully take advantage of my 4K tv, and I find that I still prefer lower resolution modes with higher framerates for many games. I like that this sort of choice is being left up to the player on consoles now though, because there are cases where 30FPS is just fine and the boosted visual effects and resolution are nice to gawk at. Is the space arena based on Halo? It sure seems like it, since it appears to be on a ring around a planet. Yeah, there are a few newly added stadiums that have been around on other consoles for some time. I have been playing in Performance mode for some time now and I'm convinced that they improved the graphics in both modes even without Quality mode being set. For example, when I play in handheld mode on a larger arena I can actually see whats going on, on the other side of the field. Cross platform party functionality is supposed to come out later this year. @Abdooooo Bummer. It was mentioned before as coming in April so I was hoping this was it. Anyone notice they're getting sent into matches already in progress more often now? I could be wrong but it felt like that was rare before, whereas now it happens to me first match almost every time I log on. If the score is close I'm fine with it, but if it's already a blowout (regardless of what side I'm on) it's like... nah. Not interested. Yeah, I sometimes get that kind of treatment when I don't play ranked. Thankfully I play ranked most of the time so I dont have to deal with that too much. With the new update there's now tournament functionality. Anyone interested in setting up a NW tournament bracket? @Abdooooo How does it work? Do you just set up a bracket and then people play matches on their own time? Or is it a live thing? Also would it be like... 1 on 1? Or teams? You setup a bracket and then you all play live. I think the only set time is when the entire bracket starts. You can have any mode play as long as the needed parties are present. You can even make it private. I'm quite proud of this one, doubly so since it was the goal that won in overtime. It's called the total package kids, defense AND offense. Finally did it, bicycle kick goal! Holy F and then I did another one literally the next game, lol. I swear I'm not purposely trying to do these, just had some good opportunities. Over 100 hours! The crazy thing is I'm only like at the 4th of 8? rankings. Gotta put in a LOT of time to get up to the top. I have been getting matched with some of the legends and such lately. I must be getting good? !